﻿Thank you for your support over the last five years. The FINAL poppy rocks has been and gone! Tickets include a drinks reception, 3 course dinner with tea and coffee plus UNLIMITED wine, beer/cider and soft drinks through the evening until 1am. Dress code is 'black tie with a poppy' and Mess dress is encouraged. 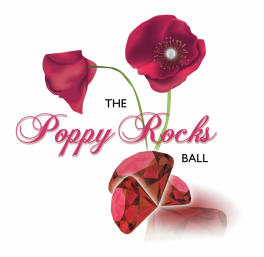 Booking deadline is 10 October 2017 and tables are only secured once a completed form and payment has been received by The Poppy Rocks Ball finance team (and according to the date/pricing laid out above). Please fill out the below application and further instructions will appear after you press 'submit'. Please note the response to requests is not an automated form generator. Please check your junk folder for a reply! All names must be provided for security reasons. E-Tickets will be sent 1 week prior to the event. All tickets must be supplied on arrival at the event. Tickets/tables are non-refundable and non-transferable. There are a limited number of tickets to this event. Please bring ID as security will be tight. Please make any dietary requirements known at time of booking.